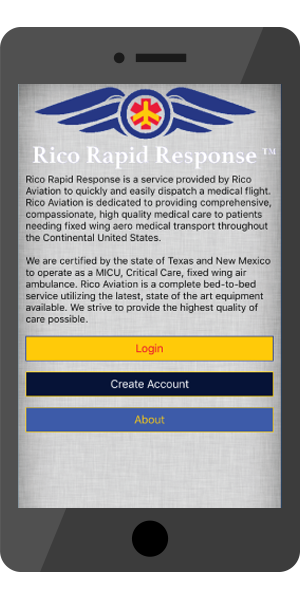 Why choose Rico Aviation over other air ambulance services? Rico is accredited by the Commission on Accreditation of Medical Transport Systems. This accreditation holds Rico to a much higher standard than is required by most states when it comes to safety and crew training. Currently, there are less than 200 aero medical services in the world that hold this accreditation. If another service is not CAMTS accredited and do not own their own planes, don’t use them. May a family member accompany the patient? Yes, Rico encourages a family member to accompany their loved one on the flight. What about filing insurance claims? Rico will file all insurance claims on the patient’s behalf. What kind of medical crew will be with the patient? All of Rico’s nurses have adult and pediatric critical care training as well as advanced trauma care. All medical staff are required to maintain advanced certifications as required by CAMTS to ensure a higher level of knowledge and skill. Rico will arrange all ground ambulances, both at transferring facility and receiving facility. This gives the family peace of mind knowing that every last detail will be taken care of by Rico. What kind of aircraft does Rico fly? Rico uses a Cessna Conquest II which is a 350 mph turboprop and a Cessna Citation CJ2 jet which is a 460 mph jet. Both planes are certified for all weather operation. Is Rico qualified to transport complex, critically ill and injured patients that require specialized care such as ventilator management? Yes, Rico specializes in ventilator and cardiac patients. All crewmembers undergo recurrent quarterly training (every 3 months) in the latest aero medical transport medicine. What are the capabilities of the Hamilton T1 ventilator ? What are the capabilities of the Zoll X series monitor? The Zoll X series monitor is capable of EKG, basic vital signs (heart rate, respiratory rate, non-invasive blood pressure, and oxygen saturation), as well as invasive blood pressure monitoring, wave form end tidal CO2 capnography, defibrillation, cardioversion, pacing, and 12 lead EKG monitoring.